Date: 22/07/10. Inception Day, need I say more. I have watched a lot of movies in my lifetime. Some have been terrible, and others have led me to believe that they are the best creations on Earth. Inception, however, is the first film where I have burst out crying during the credits because it was so amazing. It's the first film I have watched that has been so original it is unbelievable. Mostly, it is the first film that has left me frozen, or stunned, for hours after watching it. I cannot even begin to try and describe how amazing this film is. Okay, I'm not even going to try and explain the plot. Do me and yourself a favour and go and see the film. Then you try and explain what went on this movie within the logistics of a blog post. All I can tell you is that it's about dreams. Not the soppy types you see in movies starring Sandra Bullock. You may be wondering why I started crying when the credits started rolling. I had been crying at all the sad bits towards the end, but when the film ended I just started crying uncontrolably. For the life of me, I can't say why this was, but it probably had something to do with the fact that this film blew my mind in a way that no other film ever has. There is so much going on in this film, but it's fair to say I got most of what was going on. Though I know I'll certainly be going back for a second watch. The thing I can't get over though is how clever and original this film is. We have become so used to a world of popcorn flicks which are dumbed down to the lowest common denominator, but Inception is smart, even though it is still easy to follow. Christopher Nolan has truly outdone himself here. This is better than everything he has ever made. I still can't believe he, one man, did it all himself. I just wanna know what he puts in his porridge at the moment. Despite the many characters in this film, each actor performs to the best of their ability, with Leonardo DiCaprio supplying a fabulous lead and Joseph Gordon-Levitt being the stand out of the supporting cast. This could have been a simple blockbuster, but no, it is so much more than that. My advice to you is: go and see this film. Pay close attention to everything, not that that should be hard. When you come out of the cinema, you will be left speechless, frozen, amazed...I couldn't even eat after seeing this and my stomach still hurts. It runs through it's long running time like you wouldn't believe. Trust me, you will learn more from this film then you have ever learnt from school. The best thing about this movie is that it causes you to question the line between dreams and reality. Like right now, I could be dreaming, but I would never know. That's the beauty of this film. If it doesn't get Oscars for Best Picture, Best Director, and Best Original Screenplay, then someone is going to have to die. And to all you critics who gave it less than 8/10, you should be ashamed of yourselves. This is the best film to come out in years. And it has jumped straight up to be my favourite movie of all-time. 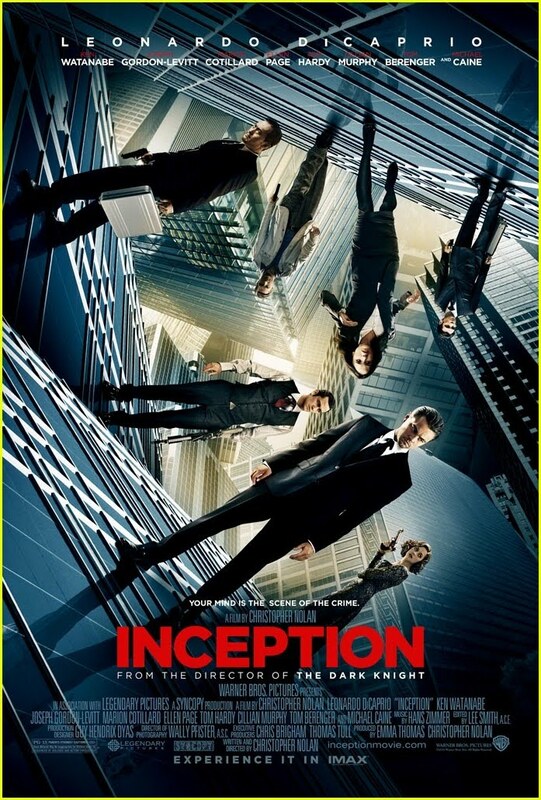 Inception restores faith in movies, with it's fabulous scenes and amazing originality. I still can't describe how amazing it is because I am in shock. I'm not so sure the movie is as staggeringly original as you may lead people to believe. It is, after all, almost the exact same plot and themes recycled from The Prestige, a much better all around film.